Is it really necessary for highly committed socialists to write long individualized takedowns of each non-Bernie candidate? They’re not bad arguments, exactly, but “as a socialist I think you should vote for Bernie because he’s a socialist rather than [candidate] who is not” doesn’t really need thousands of words to get people geared-up. I assume he is referring in part to my gigantic dissection of the life and career of Peter Buttigieg, the mayor of South Bend, Indiana. Now, I could give the glib reply (“perhaps instead of deep dives into candidates’ records and writings, we socialists should publish things like ‘Beto O’Rourke Standing On Countertops, Explained.’”) But I take earnest questions seriously. And I’ll admit, spending two-and-a-half days writing over 10,000 words on a longshot presidential candidate did feel a bit like madness at the time I was churning it out. Why bother doing this? Why pay attention to Pete Buttigieg, instead of just saying “as a socialist I think you should vote for Bernie Sanders because he’s a socialist”? Shouldn’t the reason for diving into the other candidate’s records be thumpingly obvious? Each candidate is making an argument that they would make the best president. We all have to decide on them. I think some of those candidates would not make good presidents at all. If I want other people to agree with me, I should be able to explain my reasoning to them. 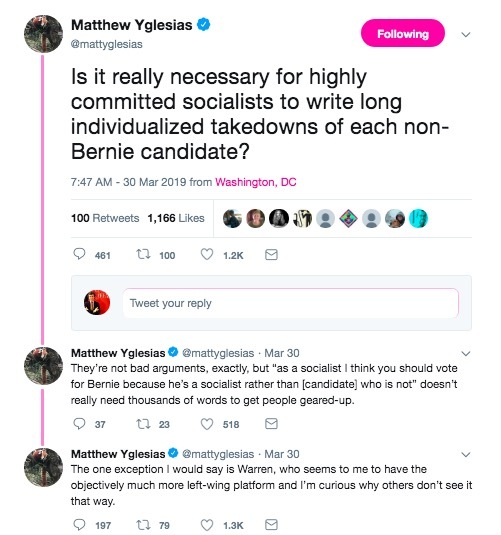 I think one problem here is that Yglesias and I have differing views on what socialist political writing is for. He thinks it is for “getting people geared-up,” i.e., taking people who are already in agreement with my political position and stirring up their passions so that they will organize and vote. I do a fair bit of that—my “rah rah, we’re gonna win” articles. But since I also recognize that I hold political positions that are not necessarily shared by a majority, it is necessary to try to convince people who are not already leftists that leftism is good. In the case of Pete Buttigieg, he has been getting lots of flattering media attention and his profile is building. Many progressives were curious about him or even impressed by him. I was curious myself, so I picked up his book. The book horrified me, because it revealed Buttigieg to be a man who doesn’t actually care about the things he says he cares about. I think there are good reasons why people should not vote for him. Now, I could just write “Pete is horrifying” and leave it at that, and people who thought Pete was horrifying would high-five me and tell me how right I am. But other people do not already share that belief and (correctly) demand some evidence and argumentation before they’re willing to sign onto it. I believe that as a political writer you need to back up your opinions, and you should be able to show undecided or even hostile people why you hold them. That seems so simple as to barely need stating, but apparently you can hold a senior position in political media without understanding it. So it’s simple: If we want to persuade people, we should have arguments. There should be arguments for why the candidates and policies we like are good, but there should also be arguments for why the candidates and policies we don’t like are not as good. Obviously, not everybody is persuadable. But a lot of people are, and if you make a solid case and have convincing responses to their objections and questions they might sign on and join your cause. I know this happens, because every time I publish an article like the Buttigieg essay, I get emails from people saying things like “I was thinking of voting for this guy, but I’m not now” or “I showed your article to my liberal parents and they liked him, but now they have qualms.” Every person you can convince further moves politics in your direction. It’s true that a lot of people on the left don’t take persuasion seriously. There is a sense among some that ideologies are intractable, or are so much the product of material conditions that rational argument is futile. I do not quite share this position. I am not so naive as to think that if you just demonstrate “pure reason” and have better and more accurate statistics, you will win the day politically. But I know that many people can be moved from believing one thing to believing another, because minds are changed every day. Look, for instance, at the reactions Natalie Wynn has gotten to her ContraPoints videos—she lays out responses to right-wing talking points, clearly and cogently, with humor and theatrics, and she gets a lot of people saying that she has shifted them away from their previous right-wing beliefs. Perhaps a small minority. But it’s a number far greater than zero. In the case of Wynn, her humor and personality is just as much a part of the “persuasion,” and I do think that you’ve got to combine ethos, logos, and pathos. Public debates are more spectacle than anything else, and sometimes in order to win them you have to resort to thunderously denouncing your opponent rather than meekly offering a list of refutations. The mistake that is frequently made is to think that because reason alone cannot persuade, persuasion must be impossible. I’m a big proponent of reason, too, though, and it’s one reason I write such ungodly long articles. They’re too long, I know. But I do have a reason for not cutting them down, and it’s not just the egotism of believing that everything that flows from my fingertips is the purest gold. (Only some of what flows from my fingertips is the purest gold and I do cut dozens of words from every 10,000 word article before publishing it.) The reason for writing long articles is that I’m able to address every possible counterargument, every thought that could be flowing through the reader’s head. By the end of an article, I want every skeptical response I can think of to have been dealt with. This is why when my colleague Eli Massey and I wrote about Sam Harris, it ended up taking 15,000 words. Harris is a notoriously argumentative fellow, and every time we wrote a sentence we could imagine exactly what he would say in response. So we had to incorporate a response to that anticipated response, and then a response to the response we knew he would give to our response, and so on until the thing bloated beyond all reason. Yes, you can say that we probably should just have dealt with the fundamentals and then stopped. But the lawyer in me wants to be very thorough, to cover every possible point in as much persuasive detail as I can.